For those who missed the Leonides because of sloppy weather..the cast offs from Haley's comet (orionids from the constellation Orion) will be streaking this weekend from midnight to the early hours. There's good news for stargazers this weekend: The annual Orionid meteor shower peaks on Friday and Saturday mornings, according to WXYZ-TV, so get ready to stay up late (or get up very early) and look to the sky to catch some of the action. The Orionids occur each October as the Earth passes through a trail of dust left by Halley's comet. When one of those dust particles — about the size of a grain of sand — enters Earth's atmosphere, it excites the air molecules through which it passes, causing them to give off light. According to NASA, the Orionids meteor shower gets its name because the meteors, or "shooting stars," look like they're coming out of part of the Constellation Orion. Unlike the Draconid meteor shower earlier this month, which was washed out by a nearly-full moon, the moon this weekend will be only partially full, NASA said in a blog post on Tuesday. Dan Malerbo, writing in the Pittsburg Post-Gazette notes that you'll have the most luck seeing meteors looking to the east before the moon rises at 1:30 a.m.
Don't stare directly at the radiant, say experienced meteor watchers. Orionids that appear there will seem short and stubby -- a result of foreshortening. Instead, look toward any dark region of the sky about 90 degrees away. You'll see just as many Orionids, but they will seem longer and more dramatic. The tails of all Orionid meteors, no matter where they appear, will point back toward the radiant in Orion. Thanks! 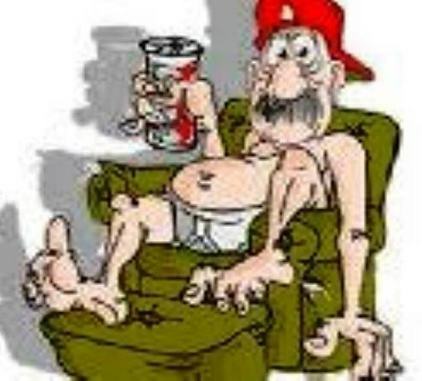 It's been raining off and on all day but when I get up to pee I'll check the skies. Got up - heard dripping drizzling sounds outside. Looked anyway. Yup. Raining. Sky is clear at the moment - well partially clear with a few cloud banks. I'll try AGAIN...When it get dark. I was just out running for an hour and I did not see a single meteor. The skies are clear up here where I am too. Yesterday it rained all day. I'm going to go back out in a little bit and look some more. I'm still waiting for that satellite to fall too...if it hasn't already. I'll have to check. Went outside (at my house). Leaves are off the trees and the street lights were blazing away. I really dislike street lights. I think that robbers and worse can just see better to break in but I have to keep my curtains drawn like a black out shelter because of the intense light. Anyway - sky was clear but I could only see about four bright stars and a planet. No meteorites. A meteor shower occurs when Earth passes through debris left by a comet. In the case of the Leonids, Earth is passing through material left by the Tempel-Tuttle comet. What we see as shooting stars will depend on the concentration of meteoroids in the path, and that concentration could be on the low side since, according to Space.com, this particular trail of debris is "typically patchy." Further complicating any earthbound viewing efforts -- as was the case with the Draconid and Perseid meteor showers earlier this year -- the Leonids will be competing with the light of the moon. Astronomy magazine reports that the moon will be near its last quarter on Thursday night, so the meteors risk being washed out. Finally, every meteor shower has a radiant, which is the point from which the meteors appear to originate. The radiant for the Leonids is -- as you may guess based on the name -- in the constellation Leo. A stay-at-home mom from the aptly named El Dorado County in California recently stumbled on something far more precious than gold. Brenda Salveson found a meteorite potentially worth $20,000 in a local park where she brings her kids and dog, a local TV station in Sacramento reports. The rock is one of many meteorites that fell from outer space, peppering Gold Country with primitive space rocks on April 22. That meteor shower and Salveson's find drew hordes of scientists and treasure-seekers to the neighborhood, reports USA Today. It's a modern day retread of the historic California Gold Rush, which brought fortune hunters to the area in the mid-1800s. 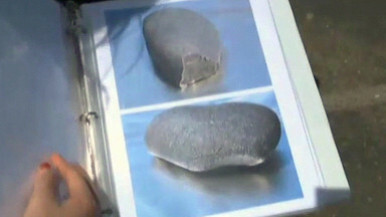 According to CBS, Salveson geologists and scientists confirmed the rock was a rare meteorite. “As I opened my hand, there was a huge gasp,” Salveson said. After finding the meteorite, Salveson's first stop was her son's elementary school classroom for a little show and tell. Her son, Tommy, told CBS Local it was "a little freaky when I shared it in my class." Scientists told CBS Local the meteorite could be 4 to 6 billion years old, dating back to the early formation of the solar system. The Los Angeles Times reports that meteorites this rare could be worth up to $1,000 per gram. Extending from January 28 to February 21 this shower is known for producing brightly coloured fireballs with long-lasting trains varying from a few seconds to several minutes. 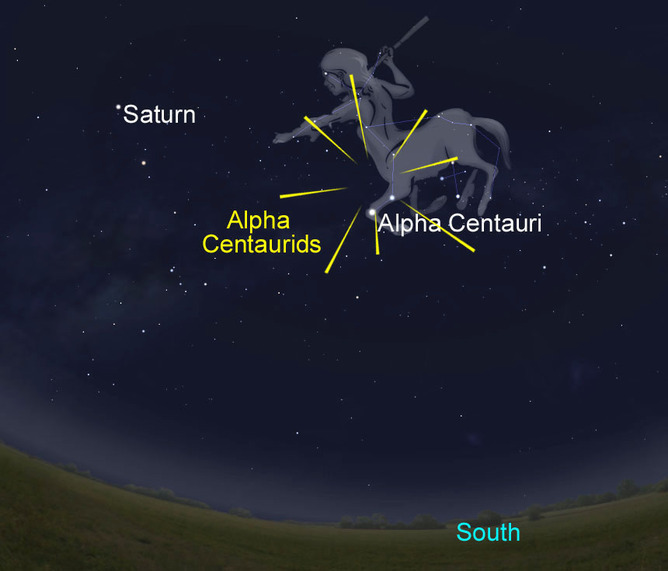 In most years, the Alpha Centaurids produce relatively low rates, with a typical maximum producing just six meteors per hour. But observers in 1974 and 1980 reported outbursts with rates of about 30 meteors per hour. This year, unfortunately, the moon will greatly hamper observations. However, the International Meteor Organisation has predicted a possible outburst in activity, and have asked for observers to be on the lookout. So despite the poor conditions, it could well be worth having a look – particularly given the frequency with which the shower produces bright fireballs. Halley’s Comet only passes the Earth every 76 years with its last appearance in 1986. And with its every passage, it shares a breath-taking and astounding view – the Eta Aquarids Meteor Shower. But the expected passage deviates from the normal trend arriving a few decades earlier which is set to happen this week. There is no need to wait for 2061 to get a glimpse of the much-awaited Aquarid meteor shower. NASA anticipates Halley’s pass to the inner solar system (nearest position it could be from Earth) to have its peak on Tuesday night towards Wednesday morning. Halley’s Comet leaves a trail of space debris, with approximately 10 meteors per hour clearly visible in the Northern hemisphere. Those located in Northeast United States might not have the luckiest time of the lives because the event has the highest possibility of being blocked by heavy clouds in the region. But skywatchers in Southeast United States has the best spot among all other US regions. And if you want the best view all over the world, then you should go to the Southern Hemisphere because it has the clearest and longest Aquarid meteor shower in all places on Earth. But no matter where you live, NASA advices that you get away from the street lights and the city and find a position where you can lie down facing east so you have a direct view of the meteor shower. You might not see it at first because the eyes should be given 30 minutes of total staring into the dark sky for proper adjustment. The oldest recording of the appearance of Halley’s Comet was in 240 BC, which were made by Chinese, Babylonian and medieval European chroniclers. The comet was named after Edmond Halley who determined its orbiting pattern back in 1705. Halley is the first comet completely understood and observed by astronomers. Contrary to what terms like "shooting stars" suggest, meteors are strictly local — interplanetary debris burns up in Earth's atmosphere about 60 miles (100 kilometers) above the planet's surface. In the inset, an Orionid meteor streaks away from the shower's radiant near the star Betelgeuse in the constellation Orion. The timed exposure by Daniel McVey shows a green hue indicative of the mineral magnesium being vaporized as the particle speeds through Earth's atmosphere. Autumn brings longer and darker nights for skywatchers, as well as a bonus: an upswing in meteors, the bright and transitory trails of tiny particles that burn up as they plunge into Earth's atmosphere at tremendous speed. Between late September and early January every year, Earth's orbit carries us through a series of debris fields left by passing comets, producing meteor showers for skywatchers to enjoy. It all kicks off this weekend with the peak of the Orionid meteor shower. Every shower has unique characteristics — some are stronger than others, some include fireballs, and others feature long, persistent trails. While the showers recur every year, moonlight can make or break a meteor shower for skywatchers. Finding the ideal viewing location, and knowing where and when to look, will increase the number of meteors you see. Many people use the phrase "shooting star" to refer to streaks of light across the sky caused by meteors, but that terminology is misleading. The phenomenon happens right here at home in our solar system, completely independent of the distant background stars. These flashes of light occur in Earth's atmosphere. Meteor showers happen when Earth's orbit carries our planet through zones of debris left in interplanetary space by periodic comets (and some asteroids). Over centuries or longer, the 1- to 2-gram particles released by the orbiting body — which typically range in size from sand grains to small pebbles — accumulate and spread out into an elongated cloud along its orbit. (The debris is analogous to the material tossed out of a dump truck as it rattles along; the roadway gets pretty dirty if the truck drives the same route many times!) If Earth's orbit intersects the comet's orbit, we experience a meteor shower that repeats annually, because Earth returns to the same location in space on the same dates every year. The year's second-brightest asteroid, a planetary conjunction, and the peak of the Leonid meteor shower, all in the sky this week. Last Quarter Moon arrives at 3:36 p.m. EST. It rises in the eastern sky around 11:30 p.m. local time and reaches its peak in the south around sunrise tomorrow morning, by which time it appears slightly less than half-lit. Throughout this period, our satellite resides among the background stars of western Leo the Lion. The second-brightest asteroid of 2017 puts on a nice show in November. Minor planet 7 Iris reached opposition and peak visibility in late October, and it now rides high in the late-evening sky among the background stars of Aries the Ram. Iris glows at 7th magnitude and should be a breeze to spot through binoculars even from the suburbs. This evening, you can locate the asteroid 1.4° south of Aries’ second-brightest star, magnitude 2.7 Beta (β) Arietis, and just 0.6° east of magnitude 3.9 Gamma (γ) Ari. Mercury passed on the far side of the Sun more than a month ago, and it is only now returning to view at dusk. From the southern United States this evening, you can find the innermost planet 5° above the southwestern horizon 30 minutes after sunset. (It appears higher the farther south you live and lower from more northerly latitudes.) Mercury shines brightly at magnitude –0.3 and should be easy to spot through binoculars. If you look carefully, you should pick up the glow of the 1st-magnitude star Antares just 2° to its lower left. A telescope reveals the planet’s disk, which spans 5.5" and shows a gibbous phase. The finest planetary conjunction of 2017 takes place in the predawn sky. Venus and Jupiter rise together in the east-southeast some 70 minutes before sunrise and climb 5° high a half-hour later. Venus shines at magnitude –3.9 and appears just 0.3° to the left of magnitude –1.7 Jupiter. Binoculars deliver stunning views of the two set against the growing twilight, while a telescope shows both in a single field. Venus measures 10" across and appears nearly full while Jupiter spans three times that diameter and lies at the center of an entourage of four bright moons. During the following days, Jupiter will climb higher while Venus sinks closer to the horizon. Brrrrrr is right! But beautiful! In that famous shower, hundreds of thousands of meteors per hour were seen! It was the first recorded meteor storm of modern times. The parent comet – Tempel-Tuttle – completes a single orbit around the sun about once every 33 years. It releases fresh material every time it enters the inner solar system and approaches the sun. 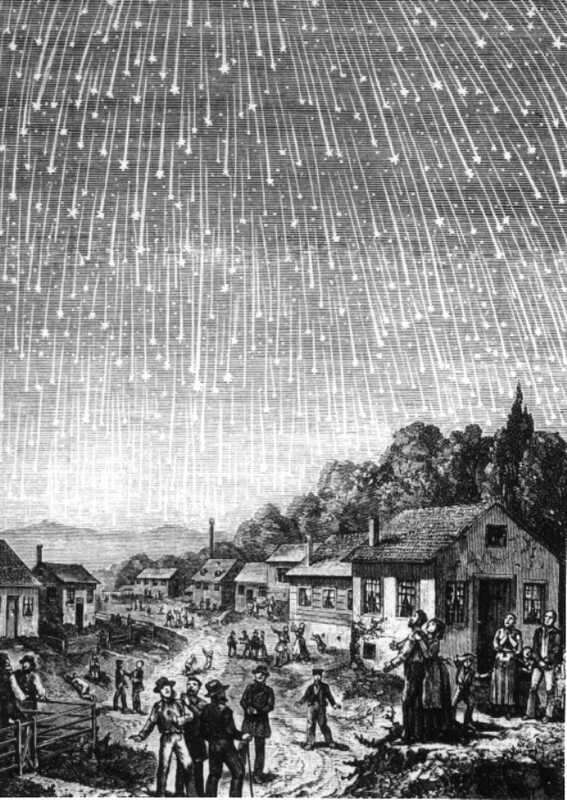 Since the 19th century, skywatchers have watched for Leonid meteor storms about every 33 years, beginning with that meteor storm of 1833.